The CEO of Connecticut's biggest manufacturer, FuelCell Energy, agrees that a turning point is now coming. Connecticut is one of just two or three places in the U.S. where stationary fuel cells are made on a large scale. While it's been an important industry here for decades, it's never been profitable. But could that be about to change? Doosan employee Ben Yoon with an individual cell stack. Four stacks are combined in a fuel cell unit. Fuel cells might have a futuristic sound, but the technology is older than you might think. "United Technologies was here over 50 years ago, developing fuel cells for the space program, the Apollo missions, into the space shuttle… that happened in this building," said Kent McCord, Director of Marketing for the company that's now known as Doosan Fuel Cell America, in South Windsor. The basic idea for a fuel cell was actually invented in the 19th century, long before the space program commercialized it. The cells take a hydrogen fuel source and combine it with oxygen from the air. The reaction creates electricity, and the only emissions are H2O -- water. "It’s a lot like a battery," said McCord. "There’s an anode and an electrode. In this case, this fuel cell runs on hydrogen, and we derive the hydrogen from natural gas." The fact that it’s an ultra-clean power source is the reason it was ideal for the space missions of the '60s and '70s. But it was always a money-losing business in the commercial world. UTC decided two years ago that fuel cells were no longer central to its plan, and put the company up for sale. It was bought briefly by ClearEdge Power, which went through bankruptcy, before being revived by the Korean industrial conglomerate Doosan. McCord says its Asian parent is giving the plant a new lease on life. "We’re building a new line here, to make some of the key cell stack components, and this is really an example of insourcing," he said. "We’re taking all of this equipment that was at a supplier of ours, and we’re decided to bring it in-house, where we have better control." This reinvestment, and Doosan’s interest in the business, reflects a new-found optimism about the fuel cell industry. It’s always been seen as a highly specialized power source — clean and reliable, yes, but dependent on a hydrogen source, and much more expensive than other options. 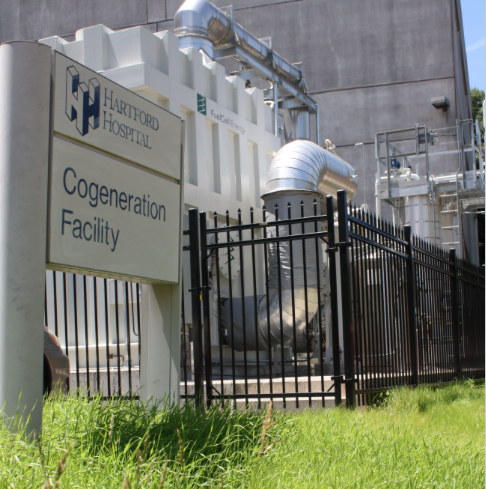 Hospitals, which need reliable power, are often fuel cell customers. This installation at Hartford Hospital was carried out by FuelCell Energy. Danbury-based FuelCell Energy was founded in the late 1960s, and now employs almost 700 people. "I think the vision that the original founders of our company had was that we would build very very large scale plants that would therefore be affordable, and the value would be placed on clean and renewable energy," said Bottone. "That was 40 years ago — it’s just been in the last several years that we’ve been able to deliver on that promise." 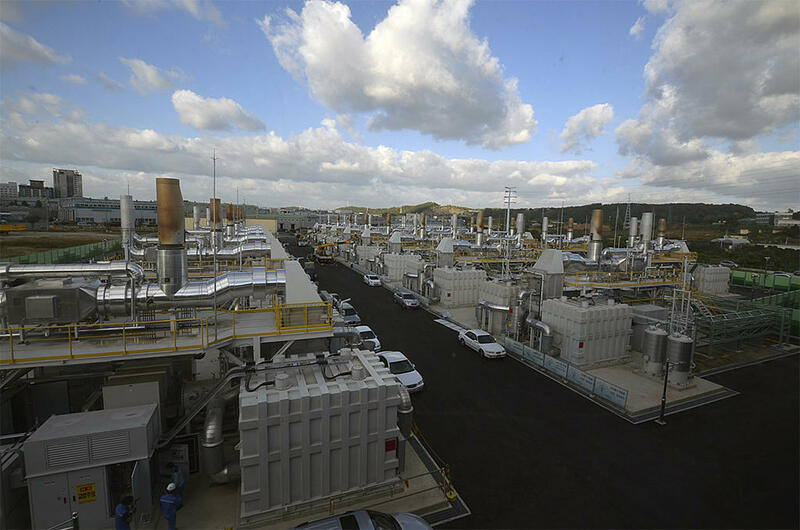 Within the last two years, FuelCell Energy installed the two biggest project in its history. A 15-megawatt power plant in Bridgeport is operated by Dominion, and feeds power from the plant into the electric grid. The company also built the world’s largest fuel cell park in South Korea. Bottone said one of the keys to these scaled-up projects is the fact that the financial community now understands fuel cells. "Today, the bigger the project, the more attractive the financing is," he said. "So being the fact that we build bigger plants, it helps us from an affordability perspective, but frankly, it also gets greater investor interest as well." 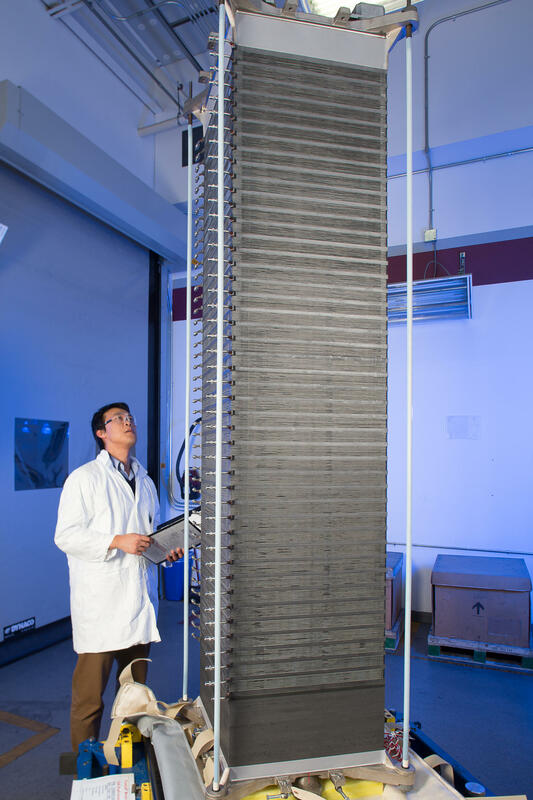 The world's largest fuel cell park in South Korea, where the dense built environment and the availability of natural gas have made fuel cells an attractive option. "For extra reliability...a fuel cell is a good choice, and it's a competitive choice." Another driver of the revived interest in fuel cells is the experience of blackouts, whether because of storms, or just the unreliability of the existing grid. A fuel cell sized to the needs of a particular commercial business can be installed on-site, providing rock solid security that the lights will never go off — a concept known as distributed generation. "If a particular end user, such as a server firm, needs ultra high reliability," said Joel Rinebold of the Connecticut Center for Advanced Technology, "they can’t afford to go down — so they’re willing to pay for extra reliability. A fuel cell is a good choice, and it’s a competitive choice, and hence we’re seeing the market select fuel cells for those applications." Rinebold heads up a regional fuel cell industry group, the Northeast Electrochemical Energy Storage Cluster. There are about 1,200 companies involved in the fuel cell supply chain in the region, providing about 5,800 jobs. "If you do the math, you can see Connecticut provides about half of that northeast market," he said. "We’ve got about half the jobs, half the revenue, half the companies. So Connecticut clearly is a focal point of this regional cluster." Rinebold said that as the market begins to be willing to pay a premium for a quiet, reliable and clean energy technology, Connecticut is well positioned. "It’s really gratifying to know that fuel cells in Europe [and] Asia are likely to have been made in the northeast," he said. "Moreover, they're likely to have been made in Connecticut than in any other location in the world." Just this month, a Canadian company became the first fuel cell producer ever to announce a quarterly profit. Connecticut’s industry hopes it's not far behind.